THERE’S plenty to do in Torrevieja in October in terms of culture and sports. 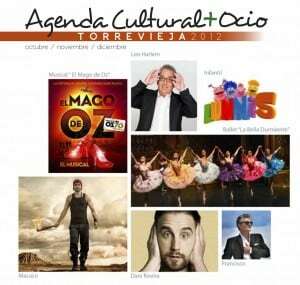 Torrevieja’s Autumn Cultural Program was launched last week, Torrevieja’s Cultural Agenda for Autumn 2012 offers a total of 214 activities through December. It includes 56 concerts, 12 galas, 12 plays, 12 lectures, 7 exhibitions, 6 contests, 6 musicals, 4 film screenings, 4 dance performances plus workshops, courses and even a Zarzuela! Find out more about these and other activities around the Southern Costa Blanca. 12,000 editions have been printed and along with the English Language version “Torrevieja Today”, both are available at the Town Hall, Tourism Offices and OARI in Torrevieja. The City of Truro Male Voice Choir have been enthralling audiences with their performances this week and you have one last chance to catch them, tonight, Thursday, at a free concert in the Cultural Casino along with renown soprano Linette Carveth, starting at 8.30pm. The Torrevieja Book Fair, XI FERIA DEL LIBRO ANTIGUO Y DE OCASIÓN starts this week takes place on the Paseo de la Libertad, Torrevieja’s waterfront area, everyday until October 21. The show of the month takes place on Saturday 20 October when famous singer and TV personality Francisco performs in the Teatro Municipal at 10.30pm. Tickets are only €12 and €15 and a good night is guaranteed for all, even if you don’t understand all that much Spanish. Sunday 21 offers football with FC Torrevieja taking on CD Castellon in the Vicente Garcia, Stadium at 6.00pm while Velocity Racing are doing it in circles again at Cartagena Circuit. The month comes to an end with a GALA ‘HALLOWEEN VARIETY SHOW” in the Teatro Municipal. It’s a Benefit Concert for Fútbol Club Torrevieja, entry costs just €5.00 with the ‘kick-off’ at 8.30pm. A fun night out for all the family. Come in Fancy Dress and enjoy the party. Featuring Footwork Dance and a few surprise artists. Two 45-minute halves and a break in the middle. 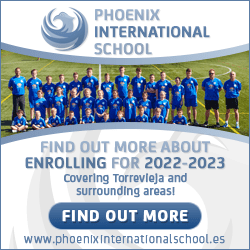 All to help develop and support Torrevieja Football. Among the surprise artists are a talented teenage brother-sister duo and it’s hoped that a number one hit recording star will also be part of the show! More details in the Cultural Guide or Torrevieja Today.